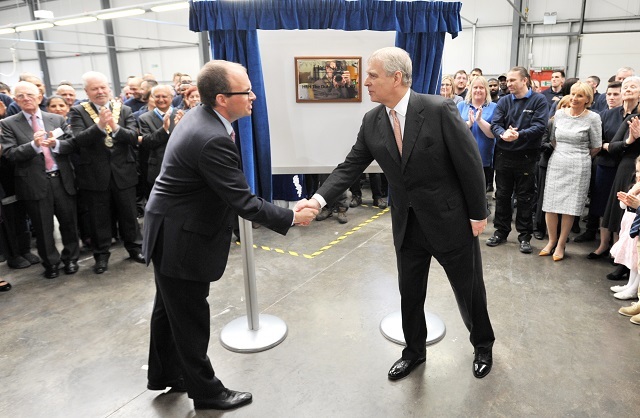 On Wednesday 13 April, Hypnos welcomed HRH, The Duke of York to officially open the new Hypnos UK factory in Castle Donington. The state-of-the-art premises on Station Road produces beds and mattresses for the hospitality market, including some of the world’s leading hotel chains. The new factory has environmentally friendly technology and has received an investment of over £750,000 to help us meet growing demand for producing beds. It is now the second site for Hypnos, with our retail factory and showroom in Princes Risborough. We have held a Royal Warrant since 1929 and the founders – the Keen Family – were honoured to show Prince Andrew around the newly acquired site. A prestigious gathering of local dignitaries, staff and key Hypnos family business members greeted HRH. He was taken on an informative and educational tour of the factory, before he unveiled a commemorative plaque and officially opened the site. Hypnos moved to the new 39,000 sq. ft. premises at Castle Donington following substantial business growth, and currently 162 people are based there. Acting as the new facility for Hypnos’ global operations, overseeing and directing activity for a network of 19 manufacturing partners, the site is key in enabling the business to meet international demand and supply hospitality sleep solutions to customers around the world. Whilst growing and expanding, we have been careful not to lose our focus on CSR and sustainability which has always been extremely important to the business. The Castle Donington factory runs on a biomass heating system which was installed as part of the company’s ethos and commitment to protecting the environment. This renewable heating source runs on wood pellets meaning no fossil fuels are involved and through this system we aim to save 74 tonnes of carbon a year.